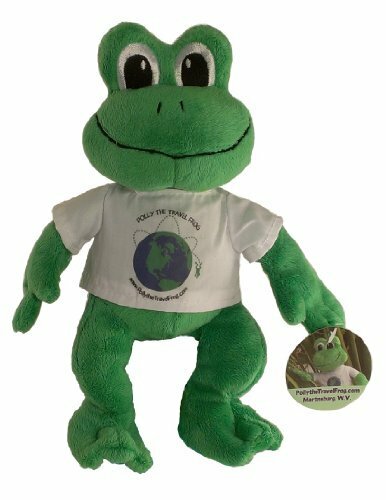 Polly wants to travel the world... Where will you take her next? We had three more places to visit before finishing our holiday in Myanmar. The first was Mount Kyaiktiyo, where the famous Golden Rock is found. We took a long bus ride, then a rough lorry ride and finally we hiked up the steep hill for almost an hour. It was very warm, but we were glad to arrive at our hotel and receive a cool fruit juice! Shortly after we paid a Foreigner Zone Fee because I am a foreign frog! After travelling to many Buddhist sites, I now know that they are best visited near sunrise and sunset because that is when they are the busiest. So one hour before sunset, we walked to the rock. Shane had to take his shoes off because it is a Buddhist site, but because I don’t wear shoes I hopped there without stopping! 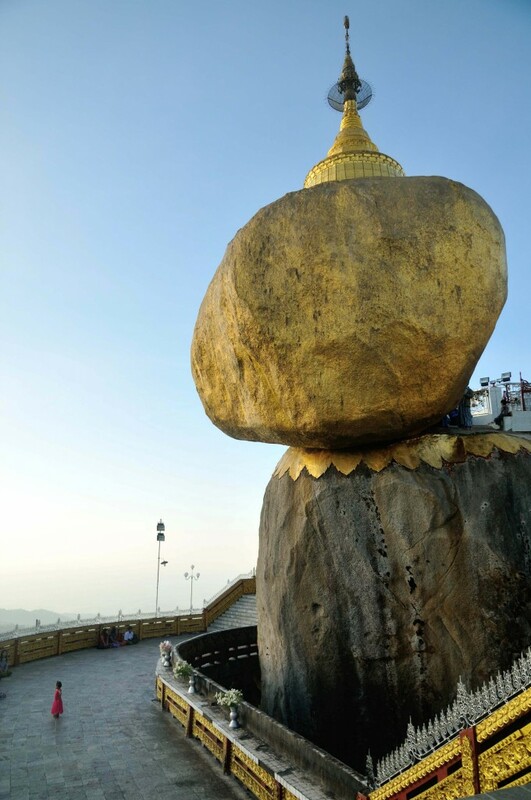 The Golden Rock sits at a strange angle, and looks as if it could fall over at any time! The local legend says that the rock can sit this way because it is held in place by a strand of Buddha’s hair. The Rock’s colour comes from it being covered with gold leaf and paint. The Golden Rock looks as if it could fall at any time! Shane visited the Rock at sunrise the next morning, but I stayed in bed! We left the mountain and visited Yangon (also known as Rangoon). 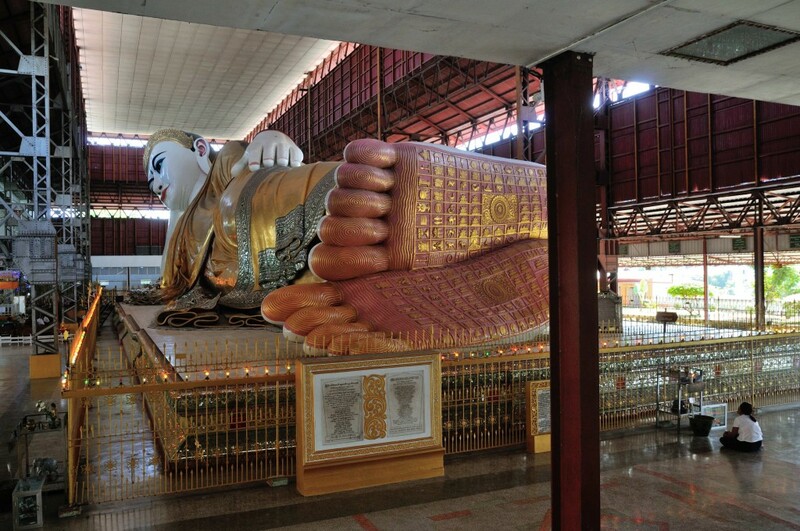 We visited a very, very large Buddha at Chaukhtatgyi Paya (Paya means temple). The statue is almost 66 metres long (216 feet) and 18 metres tall (60 feet)! 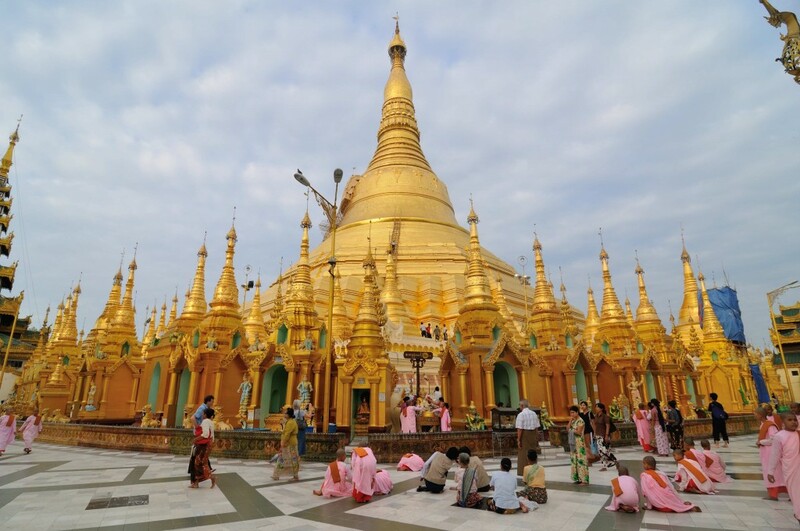 The most beautiful temple in all of Myanmar was Shwedagon Paya in Yangon. The central spire is 98 metres talls (295 feet) and it is the most important Paya in the country. There were many people praying when the sun set. It is a special place and we stayed there for many hours. 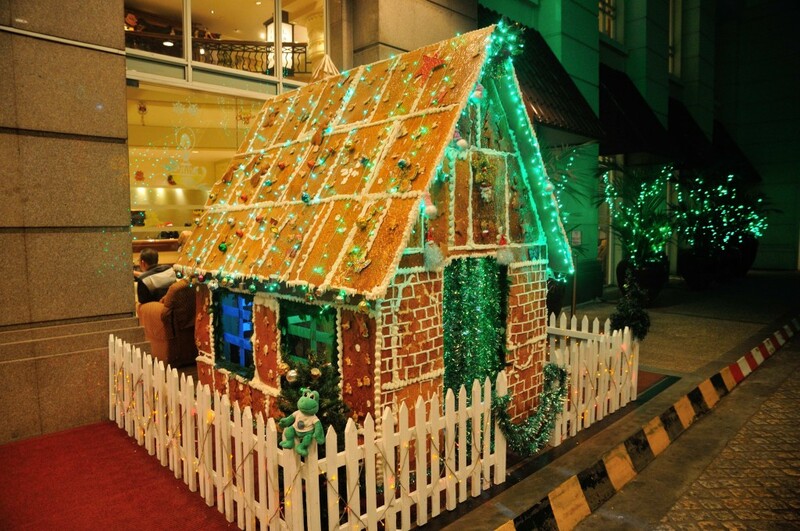 Because we visited Yangon near Christmas, the hotel we stayed in for one night had an artificial gingerbread house with lots of lights – it was pretty! Polly and an artificial Gingerbread House! The final place we visited is called Ngwe Saung (Silver Beach). 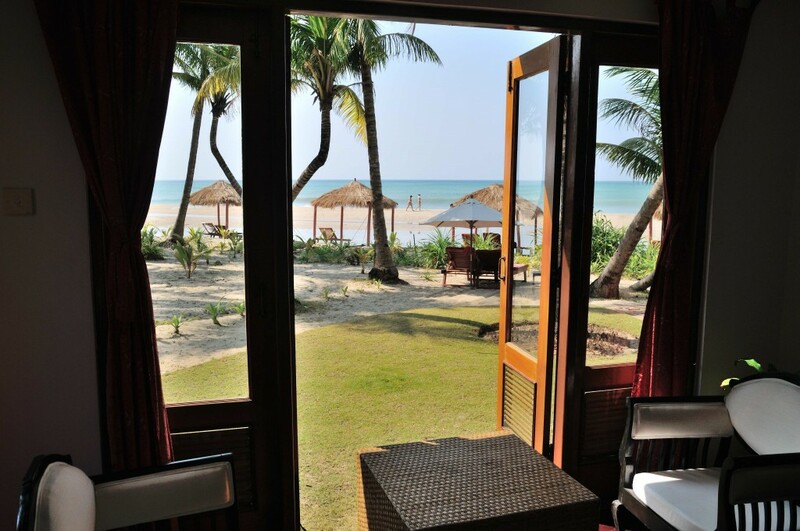 We travelled there on Christmas Eve and stayed for six nights in a bungalow at The Emerald Sea Resort. The bungalow was only a few hops away from the beach! This was a very nice place to stay, and during the day I could hop along the beach or swim in the water. 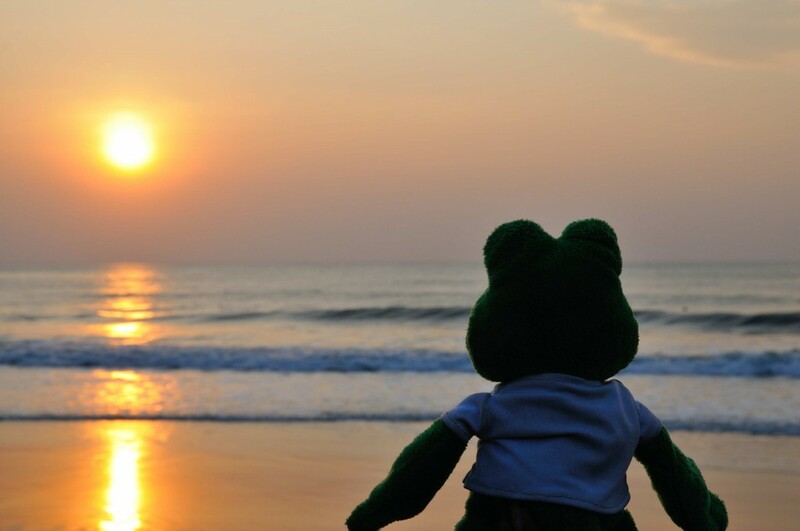 Every evening we watched the golden sunsets; there were not many people or frogs around so it was peaceful. I enjoyed travelling around Myanmar a lot – the people are friendly and there are many beautiful places to visit. 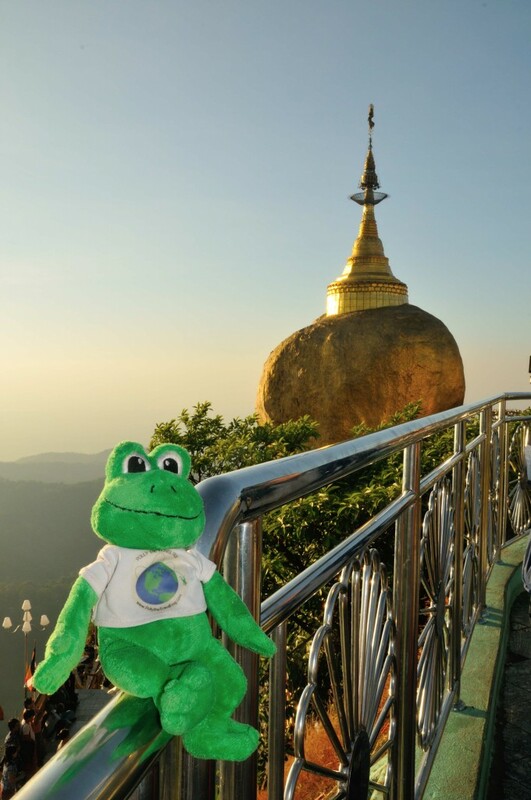 Myanmar is magical, and every frog should try to visit! 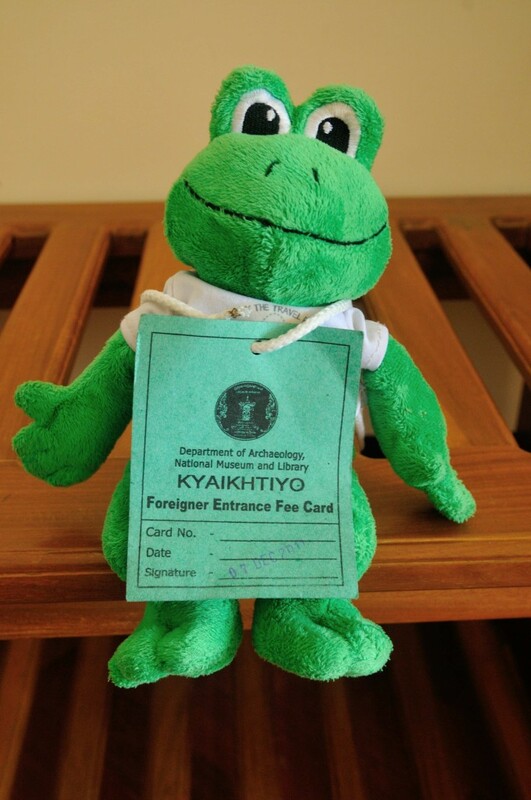 I want a Foreign Frog Visitor Pass!!!! Getting Polly to balance on the rail in the second picture is a really neat trick! Once again, I really like your post. Shane and Polly #7 always go to some really cool places. I just surfed into your site. These pictures are amazing. What a beautiful experience.Polly you are very lucky!!! Polly 7 Visits an Active Volcano! Polly 7 Helps to Make Shell Money! Polly #2 Tours San Francisco! Polly #2 Thinks the Golden Gate Bridge is the Most Beautiful Bridge in the World! Golden Gate Park is the Place to Be! Souvenir Shops Around the World!